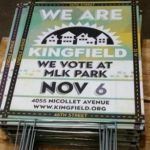 Get your We Are Kingfield / We Vote At MLK Park yard signs! With Minneapolis’ record turnout for the August primary, we need to keep that momentum moving forward! It’s simple: a volunteer will place the sign in your yard in September, and then within a week after the election, a volunteer will retrieve it for re-use in 2020. P.S. If by chance you still happen to have your sign from 2017 and it still says ‘Nov 7’, please email sarah@kingfield.org so we can get you a ‘6’ decal to change the date!